CD Baby Ragtime Millionaire Finally Back in Print! The 1998 New Moon release Ragtime Millionaire is considered by some to be the best of Lightnin's recordings, and we are happy to announce its long-awaited re-issue. This disk offers a nice variety of tunes falling into the 'piedmont' category, with songs associated with early practitioners such as Blind Boy Fuller, Josh White, Sonny Terry, Gary Davis, and Blind Blake. Other examples include tunes of more recent vintage by Turner Foddrell and John Cephus. This CD would be of interest to anyone who enjoys country blues, acoustic guitar, or authentic folk music. "With his second album, Lightnin' Wells can clearly lay claim to the title 'King Of The Piedmont Bluesmen.' This C.D. is highly recommended." "With consummate talent, clean recording and one of the best rounded collections of Piedmont blues around, this recording should be winning awards." "This acoustic guitarist, who may be the premier Piedmont blues musician today, solos on Ragtime Millionaire. Simple and clean, touched by the blues, yet tinged with happiness." R.A. Fountain Jump Little Children: Old Songs For Young Folks draws from the musical wellsprings of America's past to create a varied program of blues, old-time tunes, vaudeville, folk, and just plain silliness geared to the younger listener. The musical accompaniment in this 2008 release is as varied as the song material itself, featuring guitar, banjo, mandolin, harmonica, ukulele, and "fun" instruments such as the toy piano, train whistle, kazoo, and slide whistle. 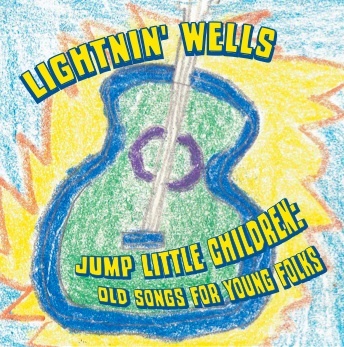 Kids just love Lightnin' Wells. That might seem an unlikely claim for an acoustic bluesman who can sing so convincingly of grown-up worries. Still, the fact is undeniable: the most responsive and joyous audience members at a Lightnin' Wells show are very often the youngest. These pieces, expertly re-mastered from home recordings made in a relaxed environment over a fifteen-year time span, distill the chemistry that Lightnin' shares with his youngest listeners. Without doubt, this CD has adult appeal as well. (It takes an older ear to gain the fullest meaning of some of the pieces.) Best of all, though, it gives parents a unique chance to connect their children to some of the deepest roots in our musical heritage -- safe passage to a sometimes rowdy past. Every one of these 20 tracks brings a beautiful gift to listeners of any age. These songs, some of which are over 100 years old, still sound fresh and vibrant in the twenty-first century, and CDs like this help to ensure the preservation of this music for future generations to enjoy and cherish. Make this CD a part of your child's library, or your own. Produced by Cliff Nelson, Don Smith, and Lightnin' Wells. R.A. Fountain Shake 'Em on Down, released in August 2008, captures Lightnin' Wells in an acoustic solo setting and features renditions of piedmont and delta blues with selections from the American old-time country and popular-music catalogs for added variety. This CD was recorded in Port Townsend, WA, and boasts excellent sound quality. Besides finger-picked acoustic and slide guitar, this program also features selections with old-time banjo, ukulele, and harmonica accompaniment for a well-varied disc of American old-time roots music. "Hearing Lightnin' Wells playing such a variety of music and styles from the pre-WWII era, one realizes the vast repertoire he has gleaned from old 78 rpm's and fellow musicians over his almost four-decade career. The man is a walking, talking, singing, playing encyclopedia of the roots of roots music so often taken for granted. You won't find a more versatile musician around -- able to move deftly between country blues, old-time banjo, and novelty tunes with a single pluck. 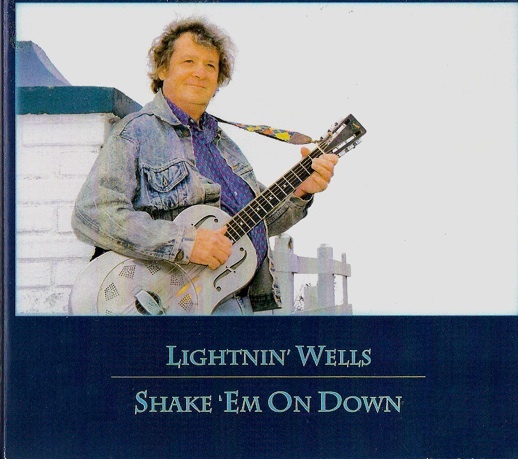 Lightnin' Wells channels the past on Shake 'Em On Down -- one that deserves a larger following in the present." Produced by Scott Porter and Lightnin' Wells. R.A. Fountain In Ragged But Right, released on the Music Maker label in 2002, Lightnin' Wells stretched out to musically explore more facets of American folk music including old-time, country, jazz, ragtime, and early popular music besides his usual beloved piedmont style blues selections. This release features Lightnin' solo on acoustic guitar and banjo-uke as well as tracks with guest artists including Cool John Ferguson (playing some great acoustic country style guitar! ), Ardie Dean on drums, and the acclaimed blues/roots musician Taj Mahal on stand-up bass. 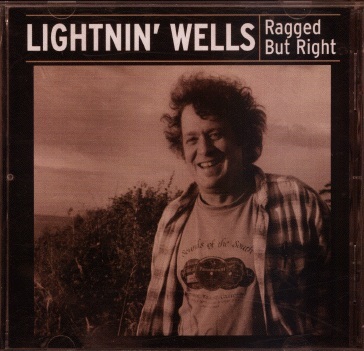 "Lightnin' Wells has put out a really strong CD here, with an unusually varied program of songs and tunes from a variety of genres. It is really a pleasure to hear a CD that could only have been done by the person who made it. 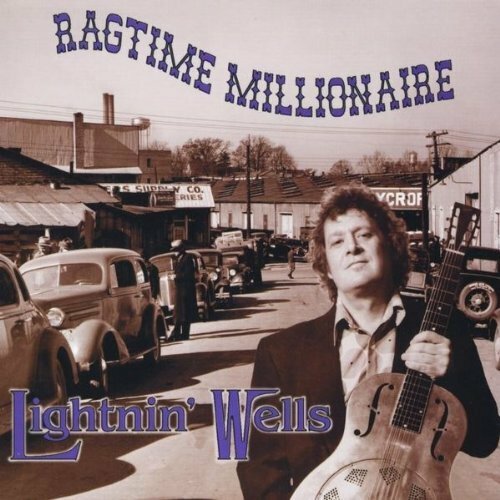 Congratulations are due to Lightnin' Wells for a great job and an excellent CD." 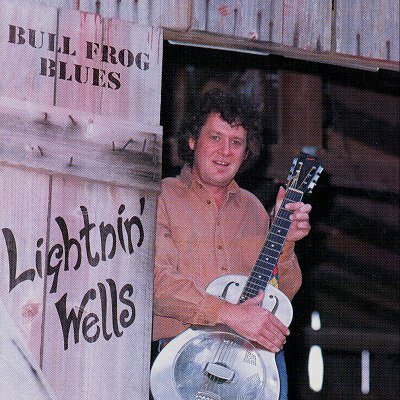 eBay Bull Frog Blues was Lightnin' Wells' first CD release on the New Moon label from 1995. It's an acoustic set featuring a variety of blues stylings with a strong emphasis on the piedmont and delta blues genres. Lightnin' is featured solo as well as backed on tracks with guest artists the Ministers Of Sinister including Max Drake (guitar, mandolin), Wezo (harmonica), Calvin Johnson (bass), and Russ Wilson (washboard). Blues veteran Big Boy Henry guests on "Spank The Baby" to help recreate a 1930s juke-joint setting. Although out of print, this CD often turns up on eBay and Amazon and is a historic and worthwhile blues release. "This is goodtime music and Wells doesn't let his scholarly knowledge of it get in the way of the fun. His relaxed vocals and spirited National steel guitar, mandolin and guitar playing are perfectly suited to the bouncy ragtime feel of the music."